Gareth Huw Davies - Greece embraces solar power - could Turkey follow? Greece embraces solar power – could Turkey follow? 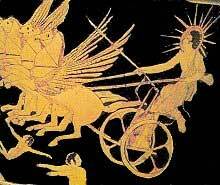 Helios drives his chariot across the heavens - and into Greece's national grid? It was easy to describe the weather on our recent break in Turkey. The sun shone powerfully throughout the day, every day, without a break, for two weeks. Friends and family who just endured a particularly grim August in the UK gave me a pained look and quickly change the subject. A first-time visitor to the houses where we stay in a little village on the south-west holiday coast might have been surprised, then, when the electricity went off in the morning on 3 or 4 days for about an hour. These were routine and planned cuts intended to spread the load on the grid, as demand is driven ever higher by air conditioning and other electrical devices. “So much sunshine, so where is the solar energy?” they might well have asked, and particularly so now that solar power is such a topic of conversation in Britain. In Turkey the sun does, of course, provide hot water to millions of houses as well as hotels and businesses, through a decades-old technology of water routed through flat panels fitted to roofs. But there is very little photovoltaic electricity generated by solar panels (PV) in a country which, on the face of it, is ideally suited for this kind of renewable energy. Few positive and decisive things are happening in debt-stricken Greece at the moment, but let’s at least take the bold proposal to launch a solar revolution as seriously as its government intends. Greece’s Energy minister George Papaconstantinou unveiled Project Helios, a national plan designed to deliver a 10-fold increase in solar energy capacity by 2020. As of now its solar capacity is 206MW; it aims to increase this to 2,200MW by 2020, rising to 10,000MW by 2050. The government hopes the plan could attract up to €20bn of foreign investment and establish the country as a net exporter of solar power, even helping other EU countries meet their renewables targets. Why should this matter to Turkey? Perhaps because of those years of intense rivalry with Greece, and a recent growing awareness that the Turkish economy is now for the first time stronger than its neighbour, with the prospect of growing posterity simply not available to a Greece deeply snared in its EU bailout obligations. Whetever Greece does, couldn’t Turkey do it better? Left to the market, electricity providers will continue to use fossil fuels. In Britain the current surge in solar power generation came directly from government policy, with the introduction of the feed-in tariff (FIT) whereby people who generate solar power generators are paid a preferential rate. Where there is a good deal to consumers, the take-up can be spectacular. Germany currently generates about 20% of its energy from renewables, much of it solar. This month the Turkish branch of the European Association for Renewable Energy said Turkey should abandon plans to build fossil fuel and nuclear power plants, and instead focus on renewable energy sources. The cost of conventional energy continues to rise, but the policy of many governments, including Turkey (although now maybe not Greece) is to play safe and stick with those tried, tested and predictable sources. Which is why Turkish holidaymakers could still be suffering power cuts for some years to come, even as the free and abundant energy source over their heads goes to waste.